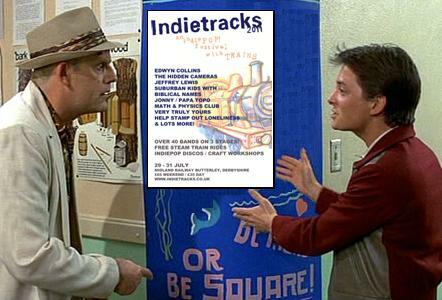 It would be particularly brilliant if anyone in a town or city near Indietracks - Ripley, Derby, Matlock, Nottingham, Sheffield, Stoke, Leicester or Birmingham - could stick up a poster and distribute some flyers for us. Please get in touch if you're able to help, and we will find a suitable reward! We're also giving out a special Indietracks prize for the person who can stick up a poster in the most impressive place, so do send us a photo if you put up a photo somewhere particularly interesting. Please ask permission first of course!